Heir to the Seat of Sundered Kings, Talos is the most important hero-god of Mankind. In his mortal form, known as Tiber Septim, he conquered all of Tamriel and ushered in the Third Era (and the Third Empire). After death, his spirit ascended to the heavens to become the ninth and youngest divine, under the name given to him by the Nords—Talos. Also called Ysmir, 'Dragon of the North'. 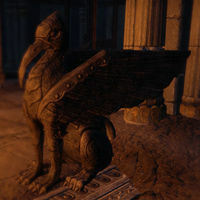 One of the Nine Divines (the major gods worshipped throughout Tamriel). Less prominent sects, such as the Talos Cult, have been inspired by his apotheosis. In the Fourth Era, worship of Talos was banned as a result of the White-Gold Concordat. However, many of the Nords of Skyrim continued to revere him despite these strict terms. Yokudan spirit of the air and sun. Tava is most famous for leading the Yokudans to the isle of Herne after the destruction of their homeland. She has since become assimilated into the mythology of Kynareth. She is still very popular in Hammerfell among sailors, and her shrines can be found in most port cities. An aspect of The Adversary, believed to be the Skaal's version of Alduin. The Tribunal, also called Almsivi, is the triune of Almalexia, Sotha Sil, and Vivec worshipped by the Dunmer, with the exception of Ashlanders. They ruled the Dunmer as living gods from a few years after the Battle of Red Mountain, circa 1E 700, until the cataclysms of the Nerevarine Prophecies, around 3E 427. In the Red Year of 4E 5, the Dunmer reverted to their traditions of pure Daedra and ancestor worship, relegating the Tribunal to saints. Trinimac was a prominent god of the early Aldmer; in some places, he was even more popular than Auri-El. He was a warrior spirit of the original elven tribes that led armies against mankind, and was known as the strongest of all the et'Ada who wandered Nirn. He is often depicted holding his sword Penitent, also known as Vosh Rakh, the "Blade of Courage". Boethiah is said to have "eaten" Trinimac and assumed his shape so the Daedric Prince could convince a throng of Aldmer to listen to him, which led to the creation of the Orcs and Chimer. Afterwards, Trinimac vanished from the mythic stage, only to return as Malacath, nothing more than a weak and vengeful version of his former glory. Tsun is the Nordic god of trials against adversity. He died defending Shor from foreign gods. Tsun and his brother Stuhn were both Shield-thanes of Shor. He currently guards the Whalebone Bridge to the Hall of Valor of Sovngarde. At Shor's bidding, he has taken on the role of the master of trials, asking new arrivals to the utopia to prove their strength in combat against him before they can enter the Hall. Tu'whacca (or simply Tuwhacca), the Tricky God, is the Yokudan God of Souls, the God of the Far Shores. Before the creation of the world, he was the god of Nobody Really Cares. When Tall Papa undertook the creation of the Walkabout, Tu'whacca found a purpose: he became the caretaker of the Far Shores, and continues to help Redguards find their way into the afterlife. His cult is sometimes associated with Arkay in the more cosmopolitan, Forebear regions of Hammerfell, where the names Tu'whacca and Arkay are basically interchangeable. Crowns detest this Imperialization, considering it a betrayal of their heritage. Nevertheless, scholars can't help but note the clear similarities between them, as well as well the similarities they both share with Xarxes of the Altmer, in both the etymology of their names and the divine roles they fill. This page was last modified on 20 April 2019, at 05:45.